“One man’s trash is another man’s treasure,” according to an old saying, and Decatur residents Deanna and Andrew Cauthen have made a business of turning what some have regarded as trash into treasured pieces of furniture. 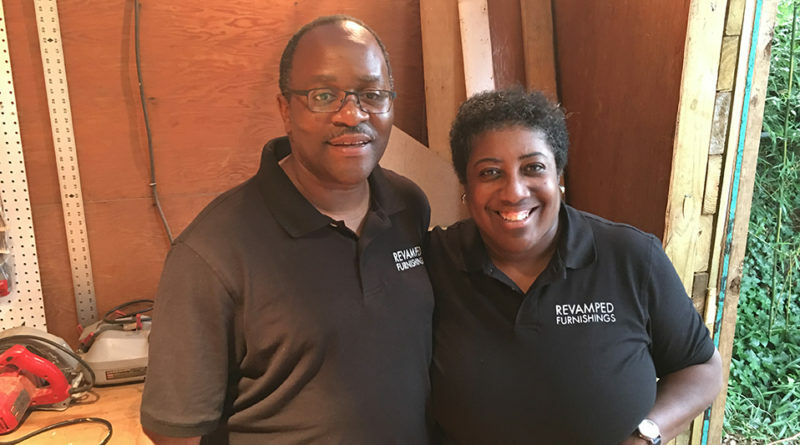 What started several years ago as a hobby and an inexpensive way to furnish their Decatur home, the married couple has turned into a lucrative home business, Revamped Furnishings. Andrew said he started years ago refurbishing furniture and has built his skills over the years. Now, when he comes home from his job with DeKalb County he usually spends a few hours restoring a piece covered in scuffed paint or marred with nicks and scratches to its former beauty. To read the article in its entirety, visit The Champion Newspaper. What do an old oak dresser, a mini refrigerator, and a Lane coffee table have in common? They were all curbside furniture finds discovered by Andrew and Deanna Cauthen, owners of ReVamped Furnishings. Although they are both successful communications professionals, helping several family members in crisis over the years had left them struggling financially. “We had gotten behind on some things and we knew we needed to increase our income, but the question was how should we do it,” said Deanna, who works part-time as a writer and public relations/marketing specialist. The Cauthens took a close look at their furniture-flipping hobby and ultimately decided to monetize it. “We essentially gave ourselves a pay raise instead of waiting for someone else to give it to us,” Deanna said. As longtime thrift store shoppers, Deanna and her husband, a communications manager, have been finding and fixing furniture for almost two decades. “We started out purchasing and refurbishing stuff just for ourselves to set up house and home when we first got married. Over time it became a hobby and we began to fix and sell items to other people,” she said. These days, most of the furniture that they flip is from curbside finds. “Every time we go out, we’re always on the lookout for the next piece. Sometimes we will come across a piece that I think is awful, but Andrew will see the potential in it. Over the years, I’ve learned to trust his judgment about those kinds of things,” said Deanna, who primarily does the marketing for the business. She also talked about the adrenaline rush they get every time she and her husband find a piece of furniture. Deanna said the business is growing by leaps and bounds. They recently built a workshop so that they can have a dedicated workspace and have had to rent a storage unit to house the furniture that needs to be refinished.